DFWCityhomes is an established flat fee MLS listing service and full service real estate company that represents buyers and sellers in Saginaw, Texas at a fraction of the cost. Our clients receive a full service experience with agent representation at all service levels and our simplified process is hassle free, proven, and effective. Interested in learning more? Click MLS Listing Services or Buyer Rebate Services to see how we may help you. Contact Us or Call (214)-207-0210 and we will explain to you how our services can save you time and money. 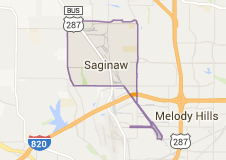 Saginaw, Texas (also known as Eagle Mountain-Saginaw) is a small city in Tarrant County, Texas, and an Inner suburb of Fort Worth. The population was 19,806 at the 2010 United States Census. Saginaw is a home rule municipality and a place where community and businesses partner to create quality for a lifetime. Saginaw's nurturing business climate, responsible citizens, high quality schools, modern infrastructure, technological resources, friendly community, environment with metropolitan advantages, and hometown appeal are just a few of the reasons why families and businesses choose the city for their home.